Reaching people beyond the walls of the Bethel Church is something Lead Pastor Sterling Lawrence has dreamed of for many years. OAKFIELD, Maine –– Reaching people beyond the walls of the Bethel Church is something Lead Pastor Sterling Lawrence has dreamed of for many years. Now that dream is becoming a reality. 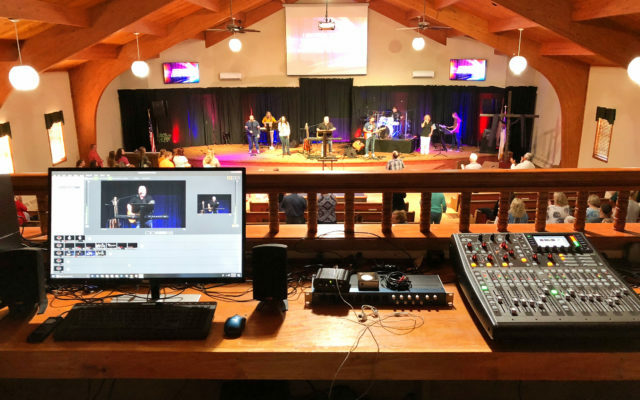 In an effort to share the word of the gospel with more people, the Bethel Church in Oakfield is broadcasting its Sunday service on the Internet via a live stream. Starting at 11 a.m., viewers can tune in to the sermon by Rev. Lawrence from anywhere in the world. He said streaming the services allows those who are shut-in or ill to feel like they are still a part of the church. He also hopes that it shows others what their culture is about in the hopes of drawing new people to the church. Bethel Church is one of just three churches in southern Aroostook County to live stream its services. The Houlton Wesleyan Church also streams its Sunday services. Military Street Baptist Church in Houlton does a live radio broadcast on WHOU 100.1 FM and its website each Sunday. The First Baptist Church in Houlton located on Court Street also shows it’s services on Facebook live on Sunday mornings at 10 a.m.
Martha Bell, ministry coordinator, said the very first streaming session took place in mid-June as the church was praying for a child who was on her way to Boston for treatments. That family was able to tune in to the broadcast. “Right from the very first Sunday it showed how God can use this to bring people from across the United States to our church here in Oakfield,” she said. Aaron Holmes, part-time media director, was instrumental in bringing the church up to speed technologically. Holmes happened upon the church by chance, and as fate would have it, it just happened to be during that first broadcast. “I had a background in live streaming and film stuff, so Sterling recruited me pretty quickly,” Holmes said. The church is outfitted with four high-definition cameras to give several different angles for Holmes to utilize during the service. He has spent the past two months tweaking the stream to the point where the church is now comfortable opening it up to the public. Lawrence said he could also see the live streaming branching out to other services in the church like weddings or funerals if families so desire by creating a private, online viewing option. Plans are also in the works to archive each Sunday service so they can be viewed later if needed. “We will go wherever God leads us,” Bell added.